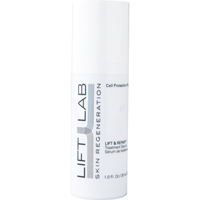 LIFTLAB combines the latest technology with scientific research to create clinically-proven anti-aging formulas. The difference is visible in the clinical findings and my skin. Eighteen years ago SkinStore.com had the bright idea to take hard-to-find clinical skin care products out of the offices of dermatologists and make them available online—and often at better prices. Today, with over 250 brands and 7,500 products, SkinStore is considered by many to be one of the world’s leading specialty skin care product retailers. They have recently expanded their assortment of premium products to include LIFTLAB clinical skin care. LIFTLAB’s scientists discovered that plant and sea life in the arctic produce unique proteins that protect them from the harsh, sub-zero climate. After isolating those proteins, the team purified and patented Cell Protection Protein (CCP), which helps restore strength and resiliency to the skin, defending against age-related and environmental damage. 100% natural, biological CCP encourages skin to produce its own proteins that promote the formation of collagen and elastin, generate cell renewal and protect against heat and cold-related damage. Formulated with the strength of CPP plus additional peptides and proteins, LIFTLAB LIFT + REPAIR Multi Active Serum helps reduce the look of fine lines and wrinkles, while helping to repair sun damage. Immediate benefits include hydration and more even skin tone while regular use aids long-term repair at the cellular level.